Colonel Gumm moves out of the Pink Chip Stamps Factory, taking its owner Pinky Pinkston along as a hostage. A message hidden by Miss Pinkston in a bowl of alphabet soup directs Batman and Robin to the International Stamp Exhibition. 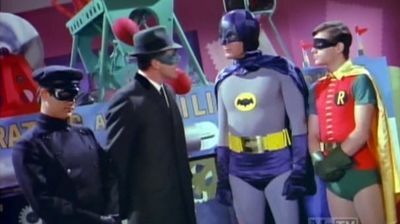 Though the Green Hornet and Kato will be attending to try to expose Colonel Gumm, Batman and Robin believe they are out for personal profit. The misunderstanding has the two sets of crime fighters fighting each other while the real criminal nearly makes off with the exhibition's rare and valuable stamps.